LINES, VINES, AND JONAS TIMES: JB WORLD TOUR PRE-SALE TICKETS THURSDAY ! 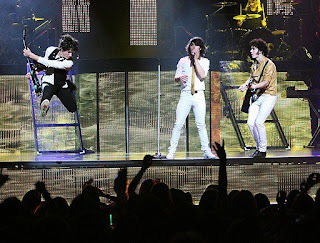 Thanks for being a part of the Jonas Brothers’ Fan Family! The entire site — photos, groups, profiles, exclusives, community-building contests — is all about supporting you, the most incredible fans on the planet! The FanFamily pre-sale for all remaining locations on the JB World Tour 09 begins tomorrow, THURSDAY, March 26th at 10 am local time. SIGN UP ON FFE FOR THE PASSWORD. Get your ticket fast and join your FanFamily friends at the hottest concert of the summer! P.S. Be sure to go to www.fanfamilyexperience.com today to check out all the latest news and content from the JB!